The Black Death was the first and most lethal outbreak of a disease that entered Italy during the end of 1347 and the beginning of 1348 and then spread across Europe in the following few years. It is generally accepted (despite recent arguments to the contrary) that this most famous medieval epidemic was caused by bubonic plague. This disease, which was identified in the late 19th century, is endemic among some rodent populations around the globe today, but does not pose a major health risk due to the efficacy of modern antibiotics. The situation, of course, was very different in the Middle Ages. The Black Death was brought on, it is believed, by an epizootic, or animal epidemic, among marmots in central Asia that caused the flea (Xenopsylla cheopsis) which passes the bacillus (Yersinia pestis) to leave its preferred host and search for new sources of food, that is, human blood. Rats brought infected fleas, the plague vector, into Europe on ships leaving the Black Sea and shores of the eastern Mediterranean. The plague entered European sea ports and traveled inland along trade routes. The effect was devastating. Historians estimate death tolls of between a third and a half of the European population. For medieval Italy it appears that some urban areas, such as Venice, Florence, and Siena, suffered staggeringly high mortality rates of over 50 percent. How did people react to this awful catastrophe? The governmental records of Italian cities present a mixed picture of the actions of civic leaders in the face of plague. In some areas, cities rapidly passed laws that attempted to prevent the entrance and spread of disease. They renewed sanitation laws designed to reduce the presence of miasma, or bad air, which medieval people believed caused disease. Thus, laws curtailed the activities of butchers, tanners, or others who worked with animal carcasses that could rot and produce miasma. The mobility of people and goods, such as woolen cloths that may trap the miasma, was restricted. Other laws regulated the location of burials and disposal of corpses. In other cities, however, it appears that government was reduced to an ineffective shadow as officials died in huge numbers and efforts to replace them could not keep up. Church records have revealed the actions of ecclesiastical organizations. Bishops all over Europe consecrated new ground for burials and arranged intercessory processions. Priests were called to celebrate masses, give sermons, and lead their parishioners in processions of prayer to beg for merciful relief from the wrath of God, which was generally believed to have brought on the epidemic. Clerics urged all individuals to confess, be penitent, and carry out acts of pious charity in order to pacify God. Thus, evidence can be found that the various communities in medieval Europe made strong attempts to counteract and deal with the crisis. 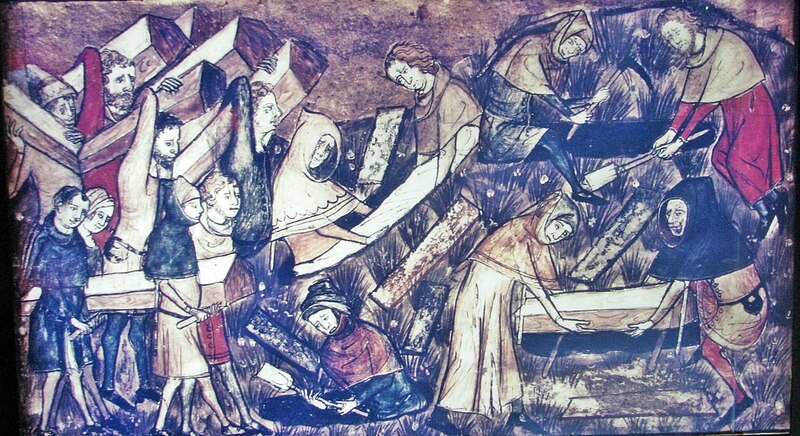 The popular view today of the Black Death, however, is one of social breakdown. This is because many chroniclers and literary authors of the time described the actions of townspeople in terms of panic, fear, and flight. Faced with a hideous—bubonic plague produces large, dark, and smelly swellings on its victims—and frightening new disease people fled to protect themselves. Chroniclers reported that doctors, clergy, and civil servants such as notaries refused to come to the aid of the ill. The chroniclers’ accounts provide the most vivid picture of the social experience of this massive mortality and have become the standard description presented in World and Western Civilization textbooks. These accounts are at their most evocative and poignant when they discuss a principal theme of the topos of social chaos, namely, the abandonment of family members, especially children. The family was the heart of medieval European society. For medieval authors, the abandonment of children by their parents meant the specter of a society that had come unraveled at its core. It is important, therefore, to try to determine what really happened to children during the Black Death. We must remember that many medieval chroniclers were religious men who wrote with a moralizing message. It is possible that many wrote their accounts of events that happened in the world around them not with the modern notion of objectively reporting the facts, but instead to advise their readers to change their ways and lead more pious lives. 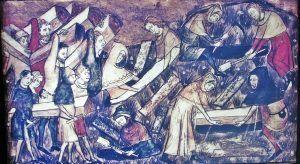 This module presents a few typical examples of what medieval Italian chroniclers had to say about the experience of children and their families during the Black Death. We do not know what parents or children themselves said about their own experience because there remain few letters and no diaries from this time. Despite the paucity of descriptive sources, parents who were dying of plague often wrote wills in which they provided for the future of their families as well as their own souls. 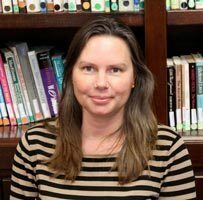 Students can compare the information —individually and in the aggregate—included in the chroniclers’ literature with that contained in parents’ wills. The archives of the town of Bologna contain the largest known number of testaments written during the Black Death. The mortality rate in Bologna may not have been as high as in Florence and Venice, but it suffered at least a 40% drop in population. The presence and contents of testaments during the epidemic can give us some indication as to whether parents were considering the fate of their children when they lay dying during the Black Death. These are formulaic documents that reveal little about the psychology of the testators themselves; they never even mention the fact that a massive epidemic was raging! Artistic sources are generally better at portraying powerful emotions, but there are no such sources that remain from the years of the Black Death. Instead, portrayals of themes related to death and morbidity became prevalent within a century of the Black Death as Europeans had become accustomed to the repeated outbreaks of plague. In fact, the Black Death was the first of a long series of plague epidemics that the people of early modern Europe suffered until the mid 1700s. It was by far the worst episode and therefore worth investigating how the most vulnerable part of the population–children–were treated during a time of social upheaval. Arrizabalaga, Jon. “Facing the Black Death: Perceptions and Reactions of University Medical Practitioners.” In Practical Medicine from Salerno to the Black Death, 237-88. Cambridge: Cambridge University Press, 1994. Benedictow, Ole J. The Black Death 1346-1353: The Complete History. Woodbridge, Suffolk: Boydell & Brewer, 2004. Cohn, Samuel Kline, Jr. The Black Death Transformed: Disease and Culture in Early Renaissance Europe. New York: Oxford University Press, 2002. Wray, Shona Kelly. “Boccaccio and the Doctors: Medicine and Compassion in the Face of Plague.” Journal of Medieval History 30 (2004), 301-22. Ziegler, Philip. The Black Death. New York: Harper, 1969; reprint 1971. This entry was posted in Children, History, Medieval, Middle Ages. Bookmark the permalink.